The Bells Gold Tracker is a periodic update and review of ASX-listed gold equities and the gold market. We run through a current market theme, key company releases (including Substantial Holding Notices), a gold-producers’ comparison table, a gold equities performance “heat-map” and some key price and relative value charts. This week we have also added a Quarterly Production Monitor, covering the top-6 ASX-listed gold producers by market capitalisation, plus a handful of others that have caught our eye over the last few months. It is our sense that there has been a general lack of interest in the gold sector through the second half of 2017. Particularly through the last quarter, the US$ gold price was looking for a theme and spent nearly all its time meandering in a US$50/oz range from US$1,250-US$1,300/oz and ETF holdings barely moved. If anything, we felt the price held up very well in the prevailing environment of a Fed raising cycle combining with low inflation to drive rising real interest rates. There was support from a weakening US dollar but overall the market appeared to feel little reason to own gold at all. Yet this is in contrast to the US$ gold price appreciating 13% over CY17, its best performance since 2010 (up 29%) and the fact that in A$ terms the gold price has been at very favourable levels for Australian producers. The A$ gold price defied bearish market consensus and averaged A$1,640/oz for the year, offering strong margins for quality local production assets with All-In-Sustaining-Costs (AISC) of ~A$1,000/oz or less. As illustrated in our Heat Map on p6, key Australian producers returned very strong share price performances in CY17: SBM up 87%, NST up 69%, RRL up 45%, EVN up 25% and SAR up 71%. This shows that despite the lack of interest there were several reasons to be cheerful with gold exposure in 2017. Gold returning as an inflation hedge: Throughout 2017 a weakening US dollar has been offset by rising real interest rates with neither really dominating the gold price. However a number of factors are now competing to influence the gold price and it is our view that what is panning out will be positive for both bullion and gold equities. With the theme of synchronised global growth gaining momentum, capital now seems to be chasing growth rather than yield. Commodity and energy prices have risen across the board in 2017 and PMI’s and GDP continue to read strongly. We think that in this environment rising bond yields are reflective not only of increased risk appetite but also of an emerging inflation theme. 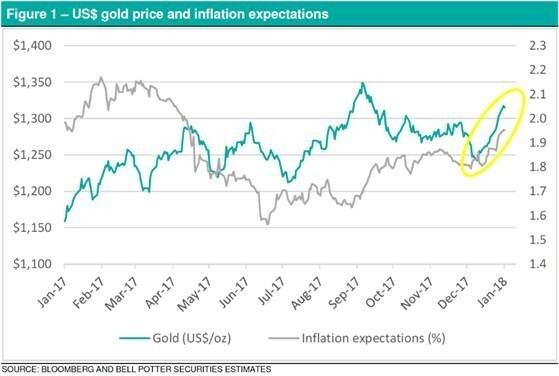 Inflation expectations (as measured by the spread between 5yr TIPS and 5yr US bonds) show a recent step up and a fresh positive correlation to the gold price – shown in the chart below. The gold market has been looking for a driver and whilst it is early days this may see gold returning to one of its traditional roles as an inflation hedge. Should this emerge it is something we would see as positive for the gold price and favourable for the lower cost producers in particular. Great time to be a debt-free, cashed-up gold producer - but just waste the shareholders' money !